If you smell gas, and can’t find the source, immediate assistance is required. When a problem involving a gas leak arises it is critical that you get it checked out by a professional. From installing new gas lines to detecting and repairing existing gas leaks, our licensed plumbers are available 24-hours a day to make sure your gas pipe repairs are completed safely so you and your family can rest easy. Did the Gas Company Turn Your Gas Off? If your gas company turned off your gas and told you to call a licensed plumbing contractor, Barker and Sons Plumbing & Rooter can help. Gas lines are an essential part of your home or business and can be very dangerous. Your home’s gas often powers many of your appliances, for example, your furnace, water heater, fireplace, oven and stove. As these appliances grow older, the seals that connect their piping can rust and cause a gas leak. Barker and Sons is a licensed plumbing contractor in Orange County that can help you find your leak, repair it, and get your gas turned back on. We can repair multiple gas lines and replace gas valves to get you back up and running in no time. Each year, Orange County and other parts of Southern California experience about 10,000 earthquakes, several of which register at least a 4.0 magnitude on the Richter scale. Earthquakes create potentially dangerous and life-threatening circumstances. If your gas line ruptures and you’re trapped inside your home, your life is in serious danger due to the possibility of asphyxia, fire and explosion. The release of natural gas into homes or buildings from existing gas lines can be catastrophic. Fortunately, the licensed technicians here at Barker & Sons Plumbing & Rooter can install an earthquake shutoff valve that would automatically shut down your gas system in the event a 5.4 or greater earthquake rocks Orange County — and chances are that one just might! Read more about the Benefits of Installing a Gas Line Shut Off Valve. Our highly experienced technicians will find your gas leak and fix it right the first time. We offer SAME DAY service with a 100% satisfaction guarantee on all services and repairs performed. We utilize the latest technologies to pinpoint the exact source of your gas leak(s). We retest your gas line system pressure to ensure there are no more leaks before we leave. Whether you’re in need of a quick gas inspection for your own peace of mind, or a full-blown gas line repair, no job is too big or too small for Barker and Sons Plumbing & Rooter. 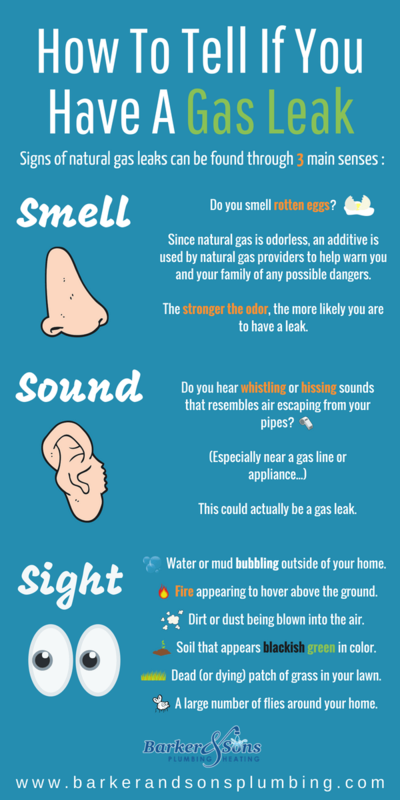 Although gas is cost-efficient and used in many homes and businesses, there are also inherent dangers associated with gas. Therefore, it is imperative that any gas work, repair or installation be done by a qualified professional. You can trust our experienced gas professionals to safely repair or replace your gas lines. At Barker & Sons, your safety is our first concern. Watch our gas leak detection video!